Torque News spoke with Bushra about how she pulled it off and built a successful dealership with a reputation of being very trustworthy and transparent. She also talks about the number one reason her dealership stands out from the competitors and the the future of diesel trucks. "There is a reason why we are able to sell trucks with a few hundred thousand miles on them," says Bushra to Torque News. You don't see an average dealership run by a female, not to mention started from ground up. What made you to start a dealership? For example, we see many women starting a salon or a boutique, but you went to start a dealership and succeeded. Why start a dealership? The spark was really from a young age, I watched my mother as I grew up go through frustrations at car dealerships and car service centers. It always seems like she was taken advantage of and that really stuck with me through the years. When I was introduced to Diesel Trucks and learned more about the essentials of the car industry, I thought that utilizing my experience in marketing and creating a niche dealership would be incredible. Once you learn how exciting and dedicated Diesel enthusiasts are, it was almost a natural decision to take that route and start that type of business. I also wanted to have a service and sales element that was transparent, fair and welcoming for all our customers. How did it go and how long did it take to get where you are now? Honestly, it wasn’t an easy road to build a dealership from the ground up. It took a lot of creative thinking, patience and resilience against the pushback I received from my peers and even competitors. Clearly starting a dealership for anyone is a tough project, but I was determined to scale this business over days, weeks, months and years. We fortunately had some early success, and over the past couple years we’ve seen some exponential growth that we never experienced beforehand. Your niche dealership is quite impressive: Not only women oriented, but also that you’re focusing on diesel trucks. Why choosing this niche? I think it’s smart to choose a segment of the market and take a bigger share, then just trying to appeal to everyone. When selling used cars, if you try and put every type on the lot you’re bound to disappoint customers if you don’t have what they want. With diesel trucks we know exactly what used trucks are popular, and even more so how to fix them better than the rest. Regarding OC Autos being women oriented, it just panned out that we happen to have a majority female management team. We obviously sell to a balanced demographic, and we have so many different types of customers from varying industries and interests purchasing our trucks. 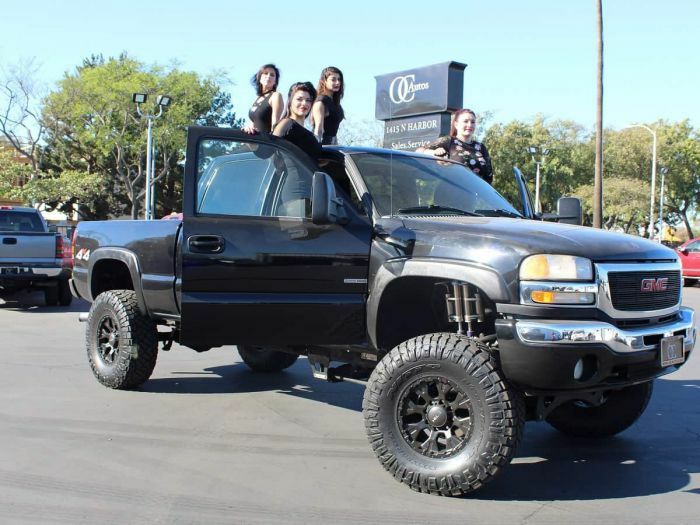 Do more women in California buy diesel trucks? Do you get more females buying from your dealerships because they know that the owner is a female? Honestly, we don’t really market ourselves that way, unless you see our social media and notice quite a few women work here, many wouldn’t even know until they visited. With some of the press we’ve received, we’ve definitely seen an uptick in female customers on the purchase, sale and service side since we have a reputation on being very trustworthy and transparent. What challenges did you have to endure in building up the dealership? Any particular or unusual challenges? Initially it was really certain people not thinking that building a vehicle dealership was a good idea. Many doubted we could pull this off, which honestly made me want to succeed even more. I think with any business securing and maintaining strong capital is important since we are constantly on the lookout to purchase great used trucks and fixing them up to sell in perfect condition. Over time it’s really making the right decisions to scale our business. In the past year we made the move to a bigger lot, which obviously has higher expenses, but we designed a plan to sustain and leverage those moves. Is there a different buying experience for a male shopper vs female shopper when they come to your dealership? If yes, is this one of the main ways your dealership stands out from the competition in your area? Not really, most of our clients are usually actively shopping around, so they have an accurate idea about what pricing should be. However, our clients who have not shopped around, and have only gained their knowledge from sites like True Car and Kelly Blue Book, tend to get surprised at how low or high those sites led them to believe about the price of the truck they are looking for. I find that both male and female shoppers tend to have a lot of questions and we try to keep things transparent with our vehicles so they know what they are getting themselves into. Every customer is different though, and that’s why we absolutely depend on having a strong reputation for being the best resource out there! The #1 way we stand out from our competition is simply our reputation for sales and maintenance. That’s really everything to us, and our customers are the absolute lifeblood of our business. I asked in a diesel truck forum a few questions and they say 6.0 & 6.4 trucks are dead and gone. How do you feel about the future of diesel longevity and service with emissions equipment being added year after year, are diesel trucks becoming a burden to own? Is there the reality? Or is there a different reality? I feel it’s quite the opposite when it comes to the the future of diesel longevity. The truth is, when it comes to diesel trucks, it’s all about maintenance. If you treat it right, and maintain it on a regular basis, ensuring that all fluids are always clean, and drive it well, then you can have a truck for life. There is a reason why we are able to sell trucks with a few hundred thousand miles on them, and actually have customers fight to be the first in line to purchase a particular truck as soon as it comes in, regardless of mileage. I can’t think of a single other vehicle that exists that one could say the same about. It is true that the 6.0 and 6.4 trucks have many issues. In all honesty, we try to steer clear of them, and do not really sell them. However, we definitely have worked with owners of these vehicles who come in to service their truck. Our service team works with these owners to ensure their engine lifespan is maximized, and we always maintain expectations that sometimes these vehicles can have engine issues. Owners put their trust into our hands to sell and maintain these vehicles to last through the long haul. For newer Diesel models, the quality of the engines has really helped push maintenance and fuel costs down, while being even more environmentally friendly year after year. Overall, I don’t see interest in older model diesels going downhill anytime soon. What are some main reasons people buy diesel trucks? Diesel trucks are absolute workhorses, and if you treat them right they will outlast any other standard truck or car. From contractors to families with a boat or RV in tow, a great diesel truck will get the job done. Diesel trucks also have better fuel economy, towing capacity and engine lifespan. What are some 3 good tips you can give to female buyers who go to a dealerships alone to buy a truck? First off, research the vehicle(s) you are looking to ideally purchase before going to the dealership. While you can check out pricing websites like True Car or KBB when it comes to any other car sale, but the truth is when it comes to diesel trucks, those websites will be misleading. Diesel truck prices are all about the market. If a truck is a hot commodity at that particular time, the price will be driven up by the market, regardless of age or mileage. Also, those sites do not really take into consideration the costs of after-market products that may have been added to the truck. Whereas, the reality is, those things can have a significant impact on pricing. The best way to really gain knowledge about the market is to shop around and compare prices so you can get an idea on what similar models are going for in your market. When you arrive at the dealer let them know you are simply looking around and only engage in longer conversation if you are serious about a test drive or exploring next purchase steps. Rule of thumb, during the process if you ever feel heavy sales tactics and any sort of pressure, don’t be afraid to walk away. It’s also easier to have financing basics in mind when you are negotiating a price and potential financing. Disclosure: While OC Autos' PR company is one of TorqueNews' occasional sponsors, the reporter had complete editorial freedom covering this story.